An 81-year-old woman ticketed for passing an idling line of cars in order to access her own driveway got a break in court, after an attorney saw her story on WECT and offered to represent her for free. 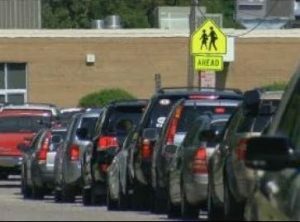 In September, we ran a story about problems residents in the Green Meadows Neighborhood were having when cars cued up outside their homes for carpool drop off and pick-up at nearby Noble Middle School. They complained the line of cars backed up for blocks and blocks outside of the school parking lot, sometimes limiting access in and out of their driveways for 30 minutes or more twice a day. Their frustration escalated when resident Joann McKendrick received a $238 ticket in September for driving around a line of cars blocking access to her house. Attorney David Collins saw the story about her ticket, and offered to represent McKendrick in court at no charge. Collins thought there were several legal defenses in her case and hoped he could get her ticket reduced if not dismissed entirely. McKendrick happily accepted his offer when we put Collins in touch with her. She had been charged with operating a motor vehicle on the wrong side of the roadway, and her case went to court earlier this month. “The prosecutor was not willing to completely dismiss it, but we were able to get it reduced to a non-moving violation with no points, and Ms. McKendrick did not have to appear in court,” Collins explained of the outcome of the case. Wilmington Police had initially beefed up their patrolling in the neighborhood at the request of residents upset about the traffic tie-ups. But Collins says Wilmington Police told him the vast majority of the subsequent tickets were given to people who lived in the neighborhood, not drivers waiting to drop off or pick up their kids from Noble Middle School. “After patrolling for a few weeks, the complaints stopped, so [police] discontinued patrolling for these type of violations,” Collins said of how the situation was explained to him. He says he was also told the school board and city planning officials were looking into potentially expanding the street to include a waiting area for cars so they would not block the flow of traffic. This entry was posted on Sunday, December 3rd, 2017 at 7:00 pm	and is filed under News. You can follow any responses to this entry through the RSS 2.0 feed. Both comments and pings are currently closed.